Winner of a 2003 Grammy award and recently named "America's Best" young classical musician by Time magazine, violinist Hilary Hahn's new Bach recording is set to echo the success of her debut CD, also devoted to Bach. 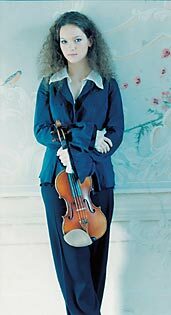 Hahn will be twenty-four on November 27, 2003, a week after her concert appearance with the Montreal Symphony Orchestra. She had her first violin lesson before she was four years old, and her first appearance with a professional orchestra when she was eleven. This was the first in a series of important concerts with major orchestras: the Baltimore Symphony Orchestra in 1991, the Cleveland Orchestra, the New York Philharmonic, the Pittsburgh Symphony Orchestra, the Budapest Festival Orchestra in 1994, and the Bavarian Radio Symphony Orchestra with Lorin Maazel in 1995 (playing Beethoven's Violin Concerto), among others. She signed an exclusive contract with Sony Classical when she was sixteen. 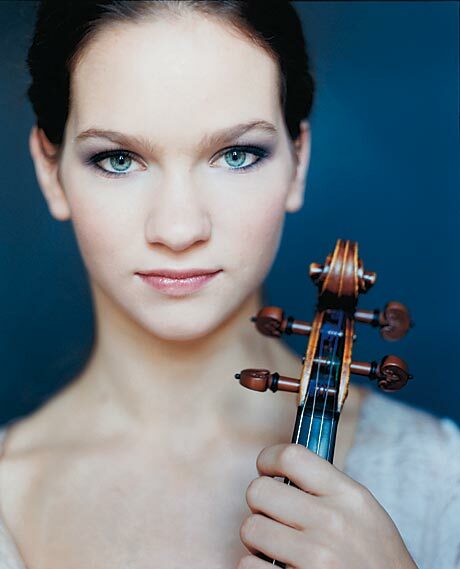 Her first CD with them (Hilary Hahn Plays Bach) netted her her first Diapason d'or prize. A new CD featuring the music of Bach is being currently released by Deutsche Grammophon (Universal). She will perform selections from it in her concerts at the Salle Wilfrid Pelletier at the Place des Arts this month (with the MSO under French maestro Michel Plasson). I had the pleasure of interviewing Hilary Hahn in mid October while she was on the U.S. West Coast finishing her holidays--no doubt well deserved. LSM: One gets the feeling that you've been glued to your violin since the age of three. Do you find that the price of virtuoso status is a bit high? HH: I don't really feel I've missed anything. No one ever stopped me from doing what I wanted, but it's true that many of my activities were linked to learning the violin, or to the art in some way. You know, I didn't give a hundred concerts a year at the age of ten! People may think that a lot happened to me when I was very young, but I think it all happened gradually, and since I began studying violin at a very young age, I could work up to a very full timetable by the age of sixteen or seventeen without it being a shock. LSM: The critics are very complimentary. Does this flood of good reviews create a lot of pressure on you? HH: (breaks into laughter) Oh, but I have bad reviews too! I had one just lately. After all, a review is simply one person's opinion of my work. It's not the final word. It's always interesting to see how someone perceives your work, to see the details that stood out for that person, no matter whether the review is good or bad. Sometimes I play in cities where, the next day, there are reviews in three or four papers, and they're all different. The same thing is true of a CD; everyone hears the same recording, it doesn't depend where they're sitting in a concert hall, and yet each has his or her own opinion. As long as a negative review isn't simply the result of someone's bad day, it's always interesting to read it, and sometimes it corroborates things I've thought of myself. Anyway, you can't please everyone! LSM: What made you leave Sony Classical for Deutsche Grammophon? HH: That's easy: my contract was finished. It was for five recordings over six years, and that had been done. You know, when a contract like that is finished you want to sign another one, but it has to be discussed. During my first contract the CDs were a success and the relationship with Sony Classical was very productive, but when it was time to sign a second contract, things seemed to proceed less naturally, for various reasons. We didn't see future projects from the same angle, and it was a kind of mutual separation. I'd heard that Deutsche Grammophon had shown some interest, and of course it's an excellent label. I discussed it with them and had a much more positive response about my future projects. What's more, certain projects were already in the works, and D.G. agreed to take them on as planned--something that I very much appreciated. LSM: You're currently bringing out your second CD devoted to the music of Bach. How did the recording go? HH: Oh, it's always different! I'd already recorded with a chamber orchestra--concertos by Brahms and Stravinsky with the Academy of St. Martin's in the Fields conducted by Sir Neville Marriner--but it was the first time I'd recorded ancient music with a chamber orchestra of the kind planned, with a harpsichord and everything. I've often worked with Jeffrey [Kahane]. We've known each other a long time, and it was a pleasure to record with him and the members of the Los Angeles Chamber Orchestra, whom I've met on other engagements. LSM: You probably know that other violinists like to add modern arrangements and disco rhythms to Bach's music, generally not bad for sales. Are you tempted by this kind of thing? HH: Nothing I do is specifically governed by the thought of selling more CDs. That being said, maybe the violinists you're talking about just like disco music and think it might be interesting to play that way. You know there are people who like it, and I think it's legitimate to do it. As far as I'm concerned, I think I have enough to do just playing straight classical music. [Laughter.] Actually, I'd find it more stressful to have to learn these pieces in another way. There are already so many ways of playing a piece without changing a single note. LSM: You're playing in Montreal with conductor Michel Plasson. Do you know him? HH: I met him once; I don't know him very well, but I know his reputation and also people who have worked with him and appreciated him, so I'm looking forward to meeting him again with this program. Ralph Vaughan Williams's The Lark Ascending is a marvellous piece; actually it's one of my mother's favourites and I'm going to record it in December to finish up a CD that will also feature Edward Elgar's Concerto for Violin. The orchestra and the violin merge with one another continually, like waves. It's very beautiful. As for Bach's Concerto for Violin No. 2, it was the first Bach concerto I learned, when I was around twelve, and I've just recorded it for this first Deutsche Grammophon CD. LSM: You must know it really well! HH: I don't know if I know it really well, because you're always discovering new stuff; but one thing's for sure: I've worked on it a lot!